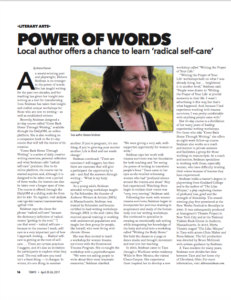 Click to download one-page Taos News article about Come Back Home Through Writing, by Ariana Kramer. Did you know that you can truly feel at home in your own body, no matter what you’ve been through, or what you’re going through? Whether you consider yourself a writer or not, in this course you will learn to take the details of your personal story, no matter how traumatic they may be, and write your way home to an unshakable, safe space for your soul to reside. During this journey you will learn to show up as your own witness in a profound and practical way, combining the wisdom of your words with the wisdom of your body as you work through the detailed exercises. This course is the way through the chaos, illness, trauma or pain that has held you back from living in peace with your body, your community and your world. Through a combination of radical self-care, daily writing exercises and personal reflection you will write yourself home to healing and peace. You will learn to trust your own voice and speak your truth. No previous writing experience is necessary. The gifts of writing are open to all. Throughout the course, you’ll be led through Creative Writing exercises, Soul-Writing Inquiry, as well as Radical Self Care practices. Each week will seamlessly build on the previous one. I want to thank you Debora, for offering this class. This is so unlike any class or course I’ve taken. I’ve looked at myself in a very different way through this writing. Thinking of my body as love, I realize that in listening and taking care of my body, I enlarge my capacity to love. The Soul Writing Journey directed me more deeply into my body needs, my body’s wounds, my body’s sacred core and holiness. I was able to feel the quiet guidance of my awakening voice, where my unhealed wounds melted, surrendered and infused my entire being. Long standing criticism of my body released into the knowing that my body is holy. I will be forever buoyed up by the deep beauty that is this program: “ Soul Writing Journey!” My struggle to become a writer has ended—finally. During this journey I came into sweet rapport with all the pieces, parts, and places of me, once lost, now newly found. I gained access to the hidden light within the chambers of my body temple and beheld my very own sleeping beauty, for which I will never again apologize. I trust my gifts.